Our Reading Rooms are a rare commodity: a silent library. With 26 desks and a growing number of comfortable armchairs, we strive to make the Reading Rooms at Gladstone's Library a place of contemplative study. 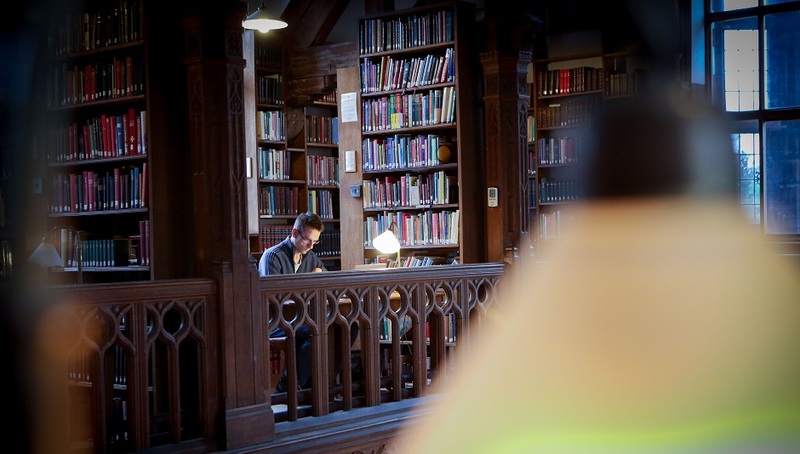 Fully Wi-Fi enabled and with almost 150,000 printed items on the open shelves, the Reading Rooms are just as Gladstone intended - a place for study. We're very proud to say that our users include school, college and university students, researchers, theologians and clergy, local historians, academics, and award-winning novelists, scriptwriters, poets, and playwrights. In the last decade we've been made aware of over 300 books that have been inspired, started, revised, finished or otherwise worked on while the writer was at Gladstone's Library. Not bad for a funny little library in North Wales. Please note that access to our Reading Rooms is as a Reader or ReaderPLUS member, as a residential guest or on a Glimpse, which we run three times daily completely free of charge, at 12pm, 2pm and 4pm only. Due to the age and the nature of the building, the upper level of the Reading Rooms and the Annex are not accessible by wheelchair-users. However if you require any items from these areas, please do ask at the Enquiry Desk and we will be happy to bring them to you.